Bat species, making use of the crevices and hollow rot holes of veteran trees for roosting, include Noctule, Brown long-eared, Daubenton’s, Leisler’s and Natterer's Bat, Other species may also be found foraging, including both forms of Pipistrelle Bat. Other mammals found in parkland habitats include Red and Fallow deer, Fox, Badger and Brown Hare as well as mice, voles and shrews. Reptiles and amphibians include Grass snake, Common Toad and Frog. Ctenophora pectinicornis, atelestes pulicarius, pachygaster atra, eudorylas fusculas, heline abdominalis and pyropterus nigroruber have all been identified in Stainborough Park. Trees. A wide range of tree species occur in parklands. Locally Oak, Birch, Ash, Hawthorn and Hazel are often present. Beech, Sweet Chestnut, Sycamore and more exotic species have often been planted. The plants that grow on the mature and veteran trees themselves - lichens, mosses and liverworts - grow in well-lit areas on bark, trunks and branches. Many species require open grown trees with spreading crowns and boughs and are often found in areas with rain tracks and wound seepages. Fungi are critical in the ecology of almost all of the wildlife associated with veteran trees and some are themselves rare and restricted to only the oldest of trees. It is fungi that cause the decay and hollowing on which the other wildlife depends. Dead, decayed or decaying wood is an essential component of parkland ecosystems; this includes heart rot, dead branches, stems and snags on living trees and fallen trees, branches and stumps. Many different species of insects - especially beetles and flies - feed as larvae within the decaying wood and veteran trees support endangered, rare, dead wood specialist invertebrates. Some wildlife species depend on cavities, cracks, crevices, loose bark, and fissures. These include bats which use these spaces for roosting. 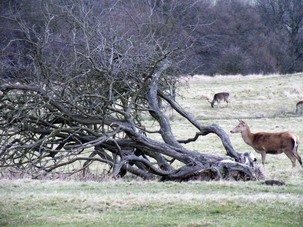 Open areas are an essential part of the parkland habitat. Grassland with flowering plants produces the nectar and pollen for adult beetles and flies whose larvae develop in dead wood. 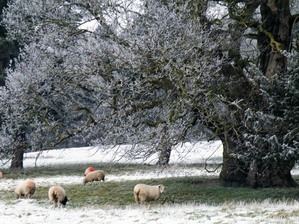 Grazing by domestic livestock or deer maintains the grassland around the characteristic veteran trees and semi-natural grasslands are important for wildlife in their own right. The mosaic of habitats in parkland supports a wide variety of wildlife: grassland, woodland, scrub, hedgerows, lakes and ponds, all add to the biodiversity. However many species of fungi, lichen, mosses, invertebrates, birds and bats, rely on veteran trees for their roosts, nests and food sources.